My daughter has requested snow for the Ogden scene in her bedroom. 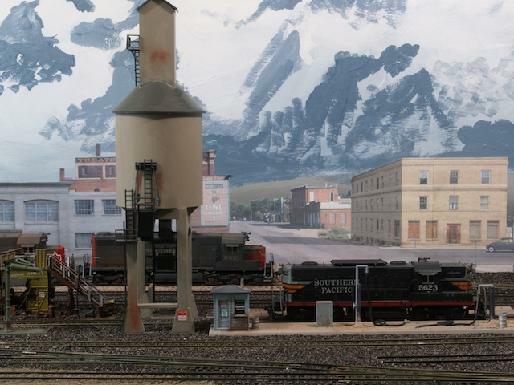 I already painted snowy mountains on the backdrop which you can see in previous photos of Ogden. I have been putting off putting the snow on the ground, mostly because I have never done snow before so I was bit intimidated to get started. After all this snow is never going to melt! 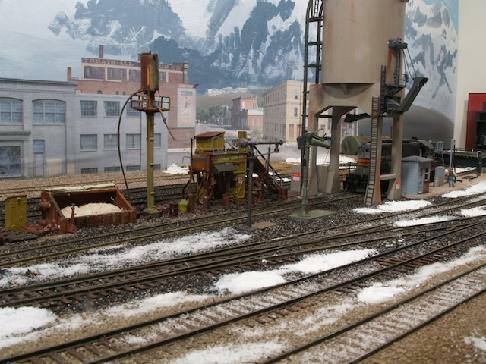 In preparation, I read over some articles on snow modeling in various books and magazines. In the end I didn't follow any of them exactly. However they all had a common theme - use some sort of thick material to build up snowbanks and coat it with some sort of white powder to simulate the graininess of snow. I decided to use Liquitex glossy gel medium since I had a lot left over from the water scenes. I mixed it 4 parts gel to 1 part titanium white acrylic artist's paint. I troweled out the mixture with a palette knife. I spread it thinly over areas where I wanted snow on the ground. I piled up a snow bank behind the shed where the workers have been stashing snow during the winter and along the road where the plow has left a snowbank that is taking longer to melt. I sprinkled the powdered snow over the gel mix to add texture. I also sprinkled powdered snow directly on the ground and fixed it with scenic cement. It took a couple of applications of the scenic cement to glue the snow down solid. It is important to glue it down so that you can vacuum the scene to remove looses particles. For one, that keeps the stuff out of your locomotives mechanims and, secondly, you can then use the vacuum to remove dust later. 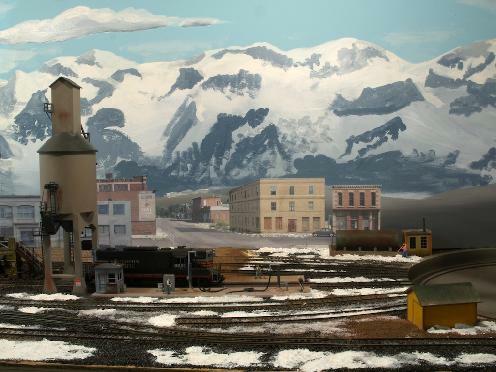 Snow scene from Tom Dill's book. No, it is not a model. This is the picture that inspired the snow scene. 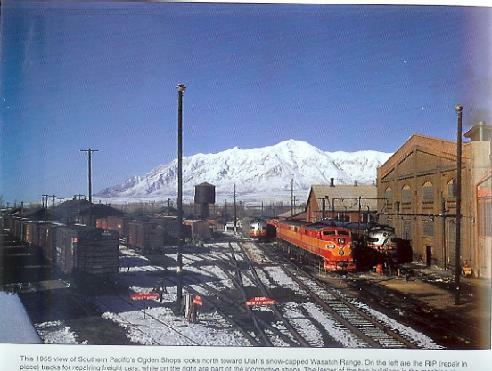 It is from the book "Southern Pacific's Historic Overland Route" by Tom Dill published by Four Ways West Publications, Copyright 1999. I needed a phot to model from since I live in San Diego - I certainly won't see snow by looking out the window! I wanted to recreate the patchy look with the black cinder ballast showing through. Note the paths worn through the snow where people have been walking and the pattern in the track where the snow is sticking longer between ties than on them. I found that if I sprinkled the powder lightly between the rails and then rubbed along with my finger, I could spread the snow so that it imitated the tie pattern in the photo. All in all the snow has turned out nicely. I am thinking about adding some more, although often times less is more, and maybe I will stop while I am ahead. I am little worried about how the snow will hold up in the long run. Will I be able to clean the dust off? At least I don't have to worry about it melting. The snow really snaps up the engine terminal scene by adding a lot of contrast. It also makes the snowy mountain backdrop work a lot better. I think the next project will be to rework the backdrop to hide the big brush strokes. It looks a lot better in person than in the photos. It is interesting how some things look better in photos and some things do not. Adding snow was a cool project for July!